﻿It Only Weighed 8.2 Pounds! These remarkable finds were all pulled from ancient bedrock gravels (I suspect Tertiary gravels ) near the tiny mining community of Washington outside Nevada City, California. This should provide a testament of sorts to my mining friends about the importance of bedrock in small-scale mining activities . Additionally, it should send a clear signal to all you treasure hunters out there that fantastic finds still await discovery and recovery. Just this past month (March 2011), Jim put his gold finds up for auction in Sacramento, California. 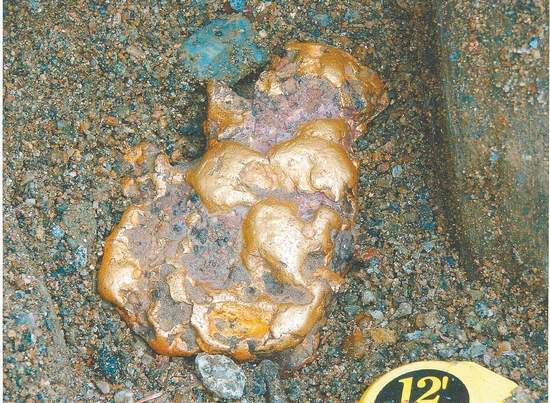 Named the “Washington Nugget,” the 8.2-troy pound gold nugget contained approximately $140,000 in actual precious metal , but as I’ve told you before, you NEVER want to sell large or unusually formed or shaped gold nuggets for their melt value. Why is that, you ask? Because large nuggets like this were melted down in the past to make bullion or coins and very few have withstood both greed and time. This is especially true in the California Motherlode region, where the largest gold rush in history took place. So, spectacular nuggets like Jim’s command much higher prices as museum or collector specimens. Oh, and if Jim S. wasn’t already standing in tall cotton, it’s estimated that another 4,000 troy ounces of placer gold still await recovery on the land he purchased as a “weekend getaway.” It seems his real estate investment in Nevada County, California has paid off handsomely, don’t you think?